Anyone who has ever worked to keep a construction site or project in compliance with the EPA knows what a quagmire the entire process can be. Take a look at one example of how one company, Anguil Aqua Systems LLC, was able to handle such a project from start to finish all while remaining compliant, saving their client tons of hassle, and most importantly, staying within budget. 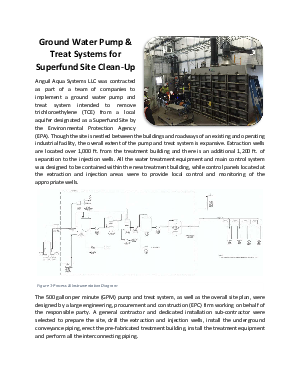 Download this report now to learn how Anguil Aqua Systems LLC was able implement a ground water pump treat system designed to remove trichloroethylene (TCE) from a local aquifer. Engaging in a two-phase project, designing and implementing. Designing a 500 gallon per minute pump and treat system. Engineering all equipment and controls around existing buildings and obstacles. Managing general contractors and sub-contractors. Providing and reviewing system controls specifications for approval by the EPA and Army Corps of Engineers. Managing major supplies of equipment, from valves, to exhaust stacks, to storage tanks. As much equipment was to be skid mounted, pre-plumbed and prewired. Take a look at the report to learn how they managed to accomplish all of this while remaining compliant, on time, and meeting all customer expectations.